Art Dodds has completed his new book “Essays on the Human Condition”, a gripping and potent examination of current issues. Dodds questions the parallels that exist between the Roman Empire and the current state of America. Published by New York City-based Page Publishing, Art Dodds’ insightful commentary on the current state of the human condition is divided into two main parts: ethics and aesthetics. Wide-ranging topics covered in his essays include black holes, soul music, gestalts, passion, Josephine Baker, Jelly Roll Morton, the blues, depravity and the culture of Walmart (just to name a few). 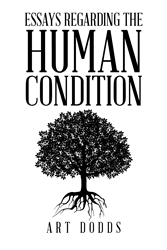 Readers who wish to experience this insightful work can purchase “Essays on the Human Condition” at bookstores everywhere, or online at the Apple iTunes store, Amazon, Kobo, Google Play or Barnes and Noble.